Eating pungent garlic could help prevent age-related memory loss suffered by Alzheimer’s and Parkinson’s patients, scientists suggest. The natural compound found in garlic – allyl sulfide – improves the health of bacteria in the stomach and also improve cognitive health in the elderly. US scientists found the compound restores trillions of microorganisms – also known as gut microbiota – in the intestine. Previous research has highlighted the importance of gut microbiota in maintaining health. But few studies have explored gut health and age-related conditions. Co-author Dr Neetu Tyagi added: “The diversity of the gut microbiota is diminished in elderly people, a life stage when neurodegenerative diseases such as Alzheimer’s and Parkinson’s develop and memory and cognitive abilities can decline. The team tested the theory on 24-month-old mice – an age which correlates to humans aged between 56 to 69-years-old. The rodents were given allyl sulfide and compared to mice who were younger and the same age and not given the garlic compound. The results revealed that the older mice who ate the supplement showed better long-term and short-term memory as well as a healthier gut compared to the other rodents who suffered impaired spatial memory. Further research found that allyl sulfide preserved a gene expression of neuronal-derived natriuretic factor (NDNF) in the brain which is crucial for long-term and short-term memory. The gene was previously discovered by University of Louisville scientists. Researchers discovered the mice who were given the garlic compound also showed higher levels of NDNF gene expression as well as hydrogen sulfide gas – a molecule that prevents intestinal inflammation in the gut. The team plan to further investigate how restored gut bacteria can prevent age-related memory loss and if garlic could even be used as a treatment for conditions such as Alzheimer’s and Parkinson’s. Garlic has been used for thousands of years to treat human disease and can reduce the risk of developing certain kinds of cancers such as breast and stomach, cardiovascular disease, and type 2 diabetes. Garlic’s unique flavour comes from sulphur compounds. Like other members of the allium family, the plant absorbs sulphate from the soil and incorporates it into amino acids and sulphur storage molecules. 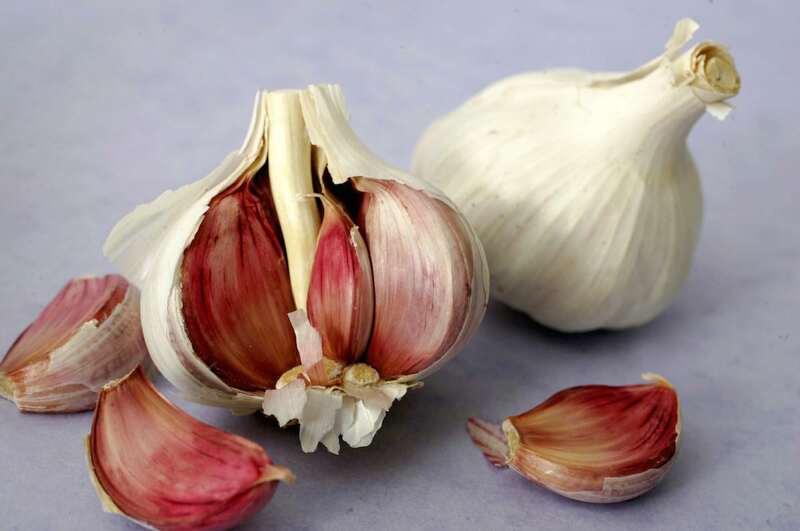 Garlic could ward off hospital superbugs, a new study revealed. Ajoene, an active sulphurous compound found in the pungent vegetable, when combined with antibiotics helps break down a bacteria’s defences. Scientists hope the breakthrough could fight incurable cystic fibrosis and chronic wounds in diabetics as well as tackling MRSA and common hospital infection P. aeruginosa. The findings were presented at the American Physiological Society’s annual meeting during the 2019 Experimental Biology meeting in Orlando.